It seemed already decided before a ball was kicked in anger at Euro2012: Germany and Spain, the two best teams in Europe, would play the Final. On the one hand, you had a German team that had been honed for the occasion, a redoubtable unit that was the apotheosis of speed and precision. On the other, you had a Spanish team that was destined to keep the ball from everyone by virtue of a biological imperative. These were two teams with a distinct identity, built and burnished over years of hard work. Even UEFA president Michel Platini couldn't stop from gushing over the prospect, unreservedly admitting that he would like to see Germany and Spain in the Final. Italy, though, had other ideas. On the eve of the tournament, when asked about yet another scandal extending its fingers into an Italian squad--and grabbing his stand-out left-back Domenico Criscito in the process--Italy coach Cesare Prandelli, perhaps exasperated at how people had trained their attention on extracurricular matters, responded disarmingly: "If it suits everyone, we are ready to withdraw from the tournament." It was the candour of the response that was notable, incisive. 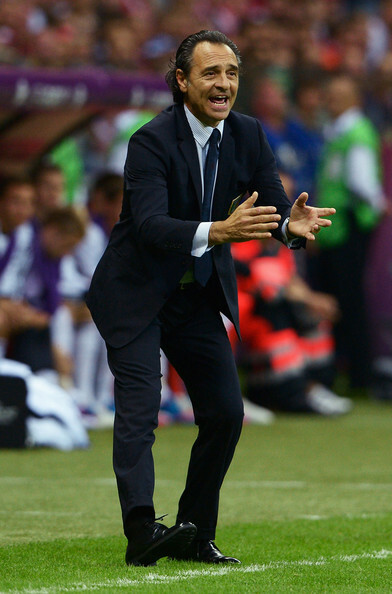 A tactful man like Prandelli had been pushed and pushed, and the strain was beginning to peek out from under him. Italy's preparations for the tournament had been chaotic not just because of the scandal, but also because of preparations that exposed, at the time, how ill-prepared Italy were. Their first friendly against Luxembourg scheduled to be played in Parma was cancelled because of an earthquake, and their second against Russia, a 3-0 defeat, was a humbling insight into what needed to be done. I, and many Azzurri devotees will agree, am thrilled that Prandelli and Italy are still here, and that no one took Prandelli's suggestion too seriously. Italy took on Spain on June 10 and Germany on June 28. Both games should have confirmed that Italy were still outside the very elite, a notch below the two competitors that were to battle in the Final in Kiev, on July 1st. They didn't. The 1-1 draw with Spain in Group C's opener, and the resounding 2-1 semi-final win over Germany have instead pushed Italy into the Final on Kiev against Spain. The predictions were only half-right. Thursday's win in particular stands out as one of the proudest moments in Italian football. Quite apart from the fact that Italy dismantled Germany (I won't be covering how, here--you all probably saw it) the game definitively established one signal thing: it made Italians, and even some neutrals, fall in love with this Italian side. The question has been asked on more than one occasion now, and the answer from many is that this Italy is almost as loveable as the ones from 1982 and 2006. Up front you have the combustible duo of Antonio Cassano and Mario Balotelli. The former is here even after a stroke he suffered this past season, and every time he breathes heavily, I get nervous. But the way he swivelled past the German defenders to set up Balotelli's first goal shows that there is blood pumping unabated. Balotelli, the unmistakeably real sociocultural response to Lega Nord and those "fans" who think that a black man can never be Italian, is Balotelli: the perfectly poised reflexive property that needs no other qualification. Balotelli is indeed Balotelli, and he is also Italy's great hope going into the Final against Spain. His brace against Germany definitively heralded his arrival after his stupendous goal against Ireland had hinted at it. In midfield, Daniele De Rossi, Claudio Marchisio, and Andrea Pirlo have shown that you don't have to have a Spanish midfield to be eminently good: the trio have been the vital signs for Italy. Pirlo has moved as he has wished, tuning out the raucous atmosphere of matches to let the slow, soothing cadence of his own game guide him and his teammates. In defence, Gianluigi Buffon, the vociferous goalkeeper who rallies perpetually, has been the clearest expression of this Italy's tenacity. Remember, it was he who was irate when Italy let Germany have even a glimmer of hope at 2-1, so late in the game. Leonardo Bonucci, Giorgio Chiellini, Andrea Barzagli and Federico Balzaretti have been playing superbly together, so much so that Prandelli has no intention of reverting back to a 3-5-2. And then there is Prandelli himself, one of the most likeable characters in Italian football. A consummate professional, who remains dignified in scandal, victory, and defeat, the 53-year-old has made people fall in love with this Italy, after Marcello Lippi had left it in disarray following the 2010 World Cup. No matter what happens on Sunday, this is an Italy to be loved. But I urge the Azzurri to play with the same assertiveness as they have lately. "We are not afraid of Spain," Prandelli said, and so they should show it. They have our support.